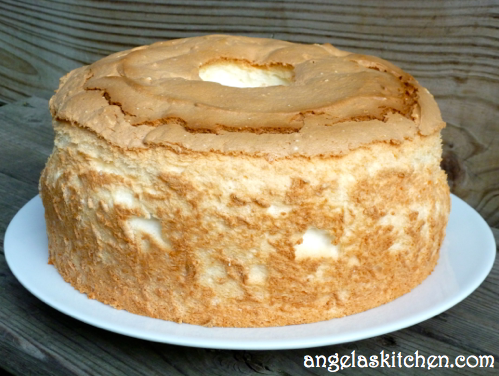 This month’s challenge was hosted by Caleigh of Gluten Free[k] and the challenge was angel food cake. I adore angel food cake! It looks so homey with it’s lovely golden crust and soft white interior and simply melts in your mouth. Angel food cake topped with whipped coconut topping and strawberries is my very favorite cake and what I always asked for as my birthday cake growing up (though it was topped with real whipped cream in those days). I can’t wait to see what versions everyone comes up with! The ratio for angel food cake is 3:3:1, that is 3 parts egg whites, 3 parts sugar and 1 part flour. The one tip I have for successful angel food cake is to use the freshest eggs you can and to use them as room temperature. Eggs are easiest to separate while cold, so I usually separated my eggs while cold, then allow them to set to get to room temp. You will get the best loft for your cake if you follow this trick. 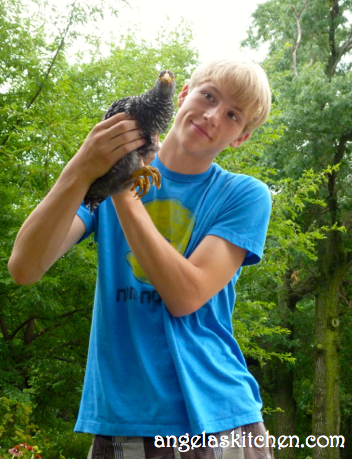 Our chicks aren't laying eggs yet, so I bought my eggs for this. I can't wait to see what difference freshly laid eggs will do for this cake! I already have a gluten free angel food cake that I am very happy with, so I just stuck with that (I am such a cheater-pants!) but thought I would do a bit of a twist on it. Instead of the vanilla base I normally do for angel food cake, I went with lemon. Instead of a glaze, I made homemade lemon curd to further boost the lemon flavor. Fruit curds are what I normally choose to make when I have an abundance of egg yolks after a baking project. Mmmm…. 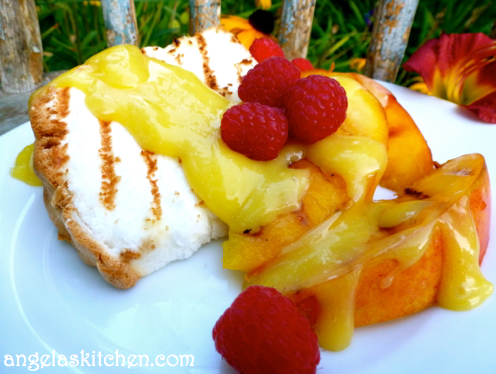 To make this more of a summer time dessert, I grilled it a bit (just enough to get grill marks) and served with grilled peaches, the lemon curd and raspberries. The resulting dessert tasted like summertime on a plate! For something a bit different, I think that adding a bit of finely chopped lemon thyme, rosemary or lavender to the batter at the same time as the zest would really elevate this cake to something special enough for a wedding shower or Easter brunch. Combine egg whites, cream of tartar, salt and zest in large mixing bowl. With mixer at high, beat until mixture forms soft peaks. Continue beating while slowly adding baker’s sugar. Add zest, vanilla and lemon extract. Beat until sugar is dissolved and mixture forms stiff peaks. With rubber spatula, gently fold in the dry starch mixture about ¼ at a time, folding just until the mixture is blended. Pour batter into ungreased 10-inch tube pan and cut through with spatula to break any air bubbles. Gently smooth top of batter with spatula. Bake at 375 degrees for 40-45 minutes or until top springs back when lightly touched. Cool on a cooling rack inverted, so cake won’t collapse. Completely cool cake before removing from pan. Run a knife around pan edge, if needed, to loosen cake. I never thought of using powdered sugar in my cake. What a great way to help keep it light! Also, I love the idea of putting it on the grill! Brilliant! love the lemon! i'm a total sucker for some good lemon curd... and it's perfect with a grilled slice of cake. love it! Oh yum! Lemon cake with lemon curd? It doesn't get any better than that! So many helpful tips! And what a beautiful cake - love the grilling and use of yolks to make lemon curd. Thank you for sharing, Angela! 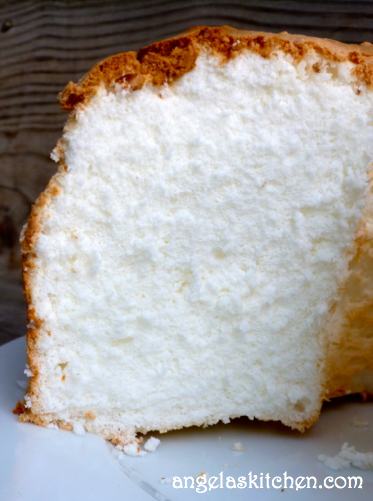 Genius - grilling your angel food cake! I must try it.